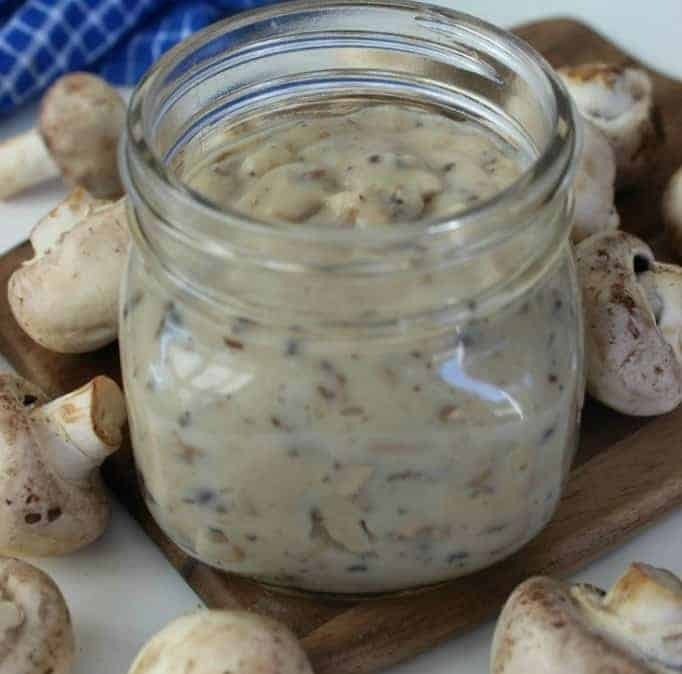 This Homemade Cream of Mushroom Soup is a great soup recipe to have on hand anytime you have a recipe that calls for cream of mushroom soup as an ingredient. It seems like so many recipes call for Cream of Mushroom Soup, especially crock pot recipes. Unfortunately the canned condensed cream of mushroom soups that you can buy at the store are usually not very good for you. If you checkout the list of ingredients, calories and sodium levels, you’ll see that they have some high numbers and lots of ingredients I could not pronounce. 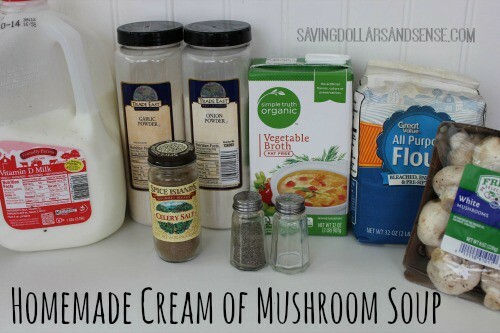 That’s why I am happy to share this super Easy Condensed Cream of Mushroom Soup recipe with you today! This particular recipe makes the equivalent of 2 cans without all the extra ingredients you can’t pronounce, and I like being able to monitor how much salt goes in it. I love making homemade soup this time of year was really surprised when I learned how easy it is to make your own homemade mushroom soup. I don’t know why but I had this idea in my head that it would a tedious process that would take a lot of time and effort. Also the homemade mushroom soup tastes SO MUCH BETTER that the store bought! Boil vegetable broth to a boil in a large pan. In a bowl, whisk together milk and flour until flour is dissolved. Add in remaining ingredients and continue whisking until incorporated. Add the milk/flour mixture to the broth, whisking to combine. Reduce heat to medium, allow to cook until thickened (3-5 minutes) stirring constantly. Remove from heat. Use immediately or store in airtight container in refrigerator. This looks delicious! I thought it was much harder to make than this. If you can get mushrooms on sale then this would be cheaper than store bought!!!! Thanks. Do you think that this could be modified to make Cream of Chicken Soup? I was thinking about omitting the mushrooms and adding finely diced cooked chicken, carrots, and celery. Absolutely! Let me know how it turns out for you. Your recipe looks like it could be converted to a dry mix, which I would just have to add to hot/boiling water, using powdered milk and a bouillon cube/powder. 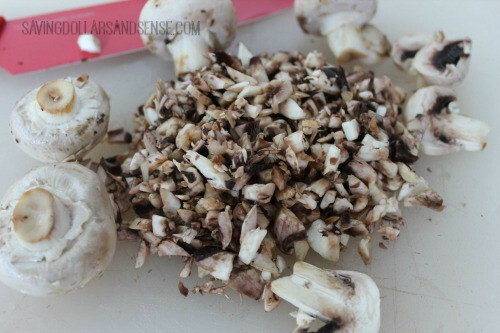 I also have dehydrated, powdered mushrooms and could add some mushroom pieces from the freezer. If I want to throw together a fast slow cooker meal, I don’t want to have to make the soup from scratch each time. Hmmm…. I think I’ll try that! Please do try it and let me know how it works for you! I would love to add it to the post for anyone else who would like to make it this way instead. I much prefer to make my own substitutes for cream of whatever soup! Have you tried freezing this recipe? I am thinking that I’d like to make a large batch and then freeze it in appropriately sized containers for use whenever I need it. I’ve never tried freezing it, but I cannot see any reason why that wouldn’t work. I may have to try that myself next time. Thanks for putting this out there. My in-laws come from the mid-west and so many of the old family recipes call for cream of mushroom. Which basically means that we haven’t eaten them in several years because I refuse to buy that stuff. I’m pining this now and I’ll give it a try. This sounds delicious! How long will it keep in the refrigerator? Have you canned this or is it just for immediate use? I have never tried canning this before. I had to leave out the celery salt -instead used celery powder. Too much sodium for me. I had a kidney removed -so I have to be careful. 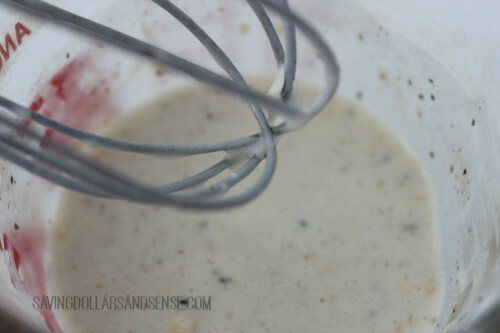 Your mushroom cream of soup and your Onion soup mix is great!! I haven’t tried that before, but I bet it would work. Can you omit milk and use water instead? I have not ever tried that, but would love to hear how it works out if you decided to try it.